James Maxwell was born in 1708, the eldest son of William and Janet Maxwell, of Kirkconnell. He was sent to Douay College in 1721, at the age of 13, to complete his education, returning to Kirkconnell seven years later. As a Catholic, James could not inherit property, so his father invested him in the lands of Kirkconnell in 1734 to ensure that James would be able to claim the property. James' main claim to fame rests with his participation in the '45 Rising. He left the estate in the capable hands of his parents and his friend Craik, who was a respected Elder of the Kirk and a neighbouring landowner. Craik owned Arbigland, where the founder of the American navy, John Paul Jones, spent his young life in a cottage on the estate. James rode off with as many men as he could muster and met up with Prince Charlie in Edinburgh, becoming one of the Prince's aides de camp and captain of the horseguards under the colonelship of Lord Elcho, the son of the Earl of Wemyss. James Maxwell spent most of the following five years in St. Germain, where he wrote an excellent account of the '45 which is as objective an account as one could wish for. He obviously had little time for Secretary Murray, who he regarded as a schemer setting one person against another. About Culloden, he wrote Exceeding few were made prisoners in a field of battle which was such a scene of horror and inhumanity as is rarely to be met with among civilised nations. James also went to Spain while on the continent, and he sent back Spanish Chestnut seeds in 1748 which were planted at Kirkconnell. The last of the Spanish Chestnut trees from those seeds still stands near Kirkconnells walled garden. With James away when his father died in 1746, keeping the estate together fell to his mother, Janet. There was much unrest among the tenants when the Duke of Cumberland's army took over the parkland at Kirkconnell for their 98 horses and 12 Galloways. The tenants argued it was James who was the rebel, not them, and yet they were the ones suffering. They were ignored. When he returned to Kirkconnell, James brought French brickmakers and bricklayers, and he proceeded to build the new part of the house  of bricks made on the site. When Janet's brother died, he left Carnsalloch to his nephew, James. 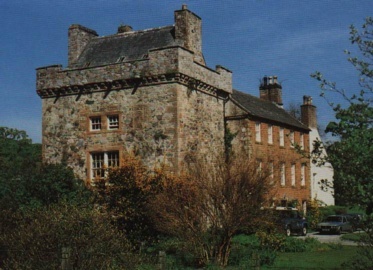 And it says a great deal for the honour of the relatives that they did not dispute the Will, especially as James sold Carnsalloch and its lands to buy land at Mabie, which adjoined his own at Kirkconnell. James married Mary Riddell of Swinburne Castle, near Hexham, Northumberland, in 1758, and they had three sons  James, who inherited Kirkconnell, William who became the friend and physician of Robert Burns and Thomas who was a merchant in Liverpool. James died in 1762 when his eldest son was barely three years old. James' brick building is the shaded, reddish section between the tower and the white stone part of Kirkconnell House. The house, inhabited by Maxwells for seven centuries, is seven miles south of Dumfries, Scotland.